Bin Laden's public admission that he was responsible for the 9/11 attacks is all it takes. Simple as that! Osama bin Laden has not made the public admission that you are claiming. Thus the reason you fail to quote it. Anyone can see that you are living a fantasy skyeagle. can you explain how you think fire can produce unreacted thermite. everyone and their children know that it is the other way around. Misleading to say the least. I have been referring to planted explosives. Don't you think that I have been examining your responses in detail? I am referring to planted explosives also. The claim is unanimous amongst “9/11 conspiracy folks” that materials were planted prior to the impacts. Please try to remember this. On the contrary, the U.S.government tried to discourage the airing of Bin Laden's tape where he admitted responsibility for the 9/11 attacks, however, Al Jazeera presented the tape regardless, and several links have been posted.That was another hint that somehow has been overlooked. The claim is unanimous amongst "9/11 conspiracy folks" that materials were planted prior to the impacts. That never happened either. Do you know what it takes to plant explosives in buildings that high above the ground? Those who have claimed that explosives were planted have no idea what it would have taken to plant explosives in the WTC buildings before, or after the impacts, but why plant explosives on the 77th floors and above anyway? So I will reiterate, that no explosives of any kind were planted nor used during the 9/11 attacks. On the contrary, the U.S.government tried to discourage the airing of Bin Laden's tape where he admitted responsibility for the 9/11 attacks, however, Al Jazeera presented the tape regardless, and several links have been posted.That is another hintt that somehow, has been overlooked. What has any of that got to do with the false claim you made? Quote bin Laden saying he ordered the hijackers to the United States in your next post. Otherwise it will be accepted as a product of your imagination. That opinion is fine by me. So long as you keep in mind that “9/11 conspiracy folks” all agree explosives were planted prior the impacts. At least I’ll feel I have achieved something then and try not to bother you again on the subject. The fire was intensed and the ingredients for thermite production was available within the structures of the buildings and aircraft. Anyone can produce thermite in their garages without the use of explosives. In addition to heat, all you need is just a few grams of iron oxide and aluminimun. Doesnt fly. You have the links. you cannot produce unreacted thermite with fire. that's just stupid. That is much more than just an opinion, because it is reality. Do you have any idea what it takes to plant explosives and how much explosives it would take and how long with would take to position the explosives in order to take down the WTC buildings? Not to mention preparing the steel structrues and planting explosives in a building full of people. Now, imagine taking large amounts of explosives, cables, and other equipment all the way up the 77th floor and above, and planting them undetected. Why plant explosives when aircraft full of fuel can do a lot of damage more efficiently? After all, millions saw the results of what happned on TV. There was never evidence of planted chemical explosions evident in the videos at the time of the collapses, and it amazed me why there are those folks who thought so. THE. LINK. DOES. NOT. SAY. WHAT. YOU. ARE. CLAIMING. You said bin Laden accepted responsibility for ordering the hijackers to the United States. The link does not contain bin Laden accepting responsibility for ordering the hijackers to the United States. Do you understand this, skyeagle? The key to the mystery is what happened to Buidling 7, a 40 story building near the WTC. It also collapsed, but it was not hit by the planes. IT looks like it was blown up, but the 911 Commission did not even mention the buiding it 500 page report. Getting back to Bin Laden, I said before the a US grand jury did not indict him for 911, only for the attacks on the embassies in Africa. Apparently the jury was not impressed by the phoney tapes of his so called confession. Notice that after his supposed assassination by the SEALS, all his documents were seized. At this time there is not one document or video tape linking him to 911. I said before that the FBI was not looking for him for the 911 attacks. They were only intersted in his attacks on the US embassies. "Usama Bin Laden is wanted in connection with the August 7, 1998 bombings of the US embassies in Dar es Salam, Tanzania and Nariobi, Kenya. These attacks killed 200 people. In addition he is a SUSPECT in other terrorists attacks througout the world." So as we see the FBI did not accept his 'confession' tapes as real or they could not find any other evidence linking him to 911, even after his death. As I have said, anyone can produce thermite with the right ingredients that have nothing to do with explosives and all of the ingredients were available when the airliners impacted the WTC buildings. BTW, how many workers were cutting beams with high-temperature torches afterwards? The building was hit by bebris, which set things in motion. There was a lawsuit that diesel tanks within the buildings were responsible for taking down that building, but the judge disagreed, however, read this very carefully, and another reason why I have said that there was no way that planted explosives brought down the WTC buildings and that the buildings collapsed exactly as I have decribed. In regards to building 7, you can't set up an internal demolition for a 47-story, steel-frame building in two and a half hours, nor two and a half days or weeks. It takes months to carefully place charges through the structure, so that the first go off at the bottom, implode inward. I have posted this photo before and it is to make my point very clear that if explosives are not carefully placed, you will have what you see in the photo; undamaged support steel beams sitting in the middle of a bomb crater. To reiterate, there was no way that anyone could prepare the steel support beams nor plant enough explosives in the time frame of less than an hour to bring down the WTC buildings, much less do so without the attention of thousands of workers within those buildings, and there is no evidence of chemical explosions in the videos. To further add, it has been shown and proven, that thermite could not have been responsible for bringing down the WTC buildings,and once again, after more than 10 years after the 9/11 attacks, no evidence of chemical explosives has ever surfaced. I have read it numerous times. As I said, the link does not contain bin Laden accepting responsibility for ordering the hijackers to the United States. Your point blank refusal to quote such an excerpt from his speech proves this. Technically, it doesn't. But the fact that skyeagle doesn't quote it despite your negation of his claim certainly lends credibility to the notion that Bin Laden makes no such confession. In general, I've found your attention to detail to be good, so I think you're right, but for skyeagle's sake, can you post the link so that I can verify that Bin Laden doesn't make this confession that skyeagle thinks he made? "We decided to destroy towers in America." "God knows that it had not occurred to our mind to attack the towers, but after our patience ran out and we saw the injustice and inflexibility of the American-Israeli alliance toward our people in Palestine and Lebanon, this came to my mind." Crashed into New York City's World Trade Center North Tower at 8.48 a.m. Crashed into New York City's World Trade Center South Tower at 9.03 a.m. Crashed into the Pentagon at 9.39 a.m. Crashed in a Pennsylvania field at 10.10 a.m.
Not long after the attacks, officials in the U.S. identified Pakistan-born Khalid Sheik Mohammed as the senior al-Qaeda strategist who orchestrated the plot. He had been previously implicated in a 1995 plot known as Operation Bojinka, an early version of the Sept. 11 assault concept, that was broken up by police in the Philippines before it could be carried out. Mohammed was captured in 2003. The attacks forced a new reality on the Western world, and on Americans in particular. In the ensuing years, particularly before a formal U.S. inquiry known as the 9/11 Commission, evidence emerged that American authorities had received warnings about imminent attacks in the months leading up to Sept. 11, both from their own intelligence agencies and at least four foreign government. we are not talking about "ingredients of thermite", we are talking about engineered unreacted nanothermite. you cannot produce unreacted thermite with a thermal lance or other cutting equipment. Since it is obvious that there was no way that steel support beams could have been properly prepared and explosives properly planted at the 77th floors and above before impact and not attract the attention of thousands of workers inside the buildings, no explosives could have been planted and not draw a lot of attention. To underline that point even further, there is no evidence of secondary chemical explosions during the time of impacts, and that was another hint of many that went unnoticed. To reiterate once again, no explosives of any kind were planted before, nor after the aircraft impacts. Those who make such claims should know they cannot make such claims and not attract attention in the absence of such evidence, especially when time frames and proper preparations are taken into consideraton. It doesn't matter, since there was no way to properly prepare structrual support beams and plant explosives in the time frame in question. Since there were no secondaries, that is another indication that no explosives were planted at the level where the aircraft impacted the WTC buildings, which is where the collapse of both buildings originated. Why waste time planting explosives when aircraft were sufficient to bring down the buildings? With proper ingredients, you can create thermite in your garages using a sparkler or even a torch. He’s on about the 2004 bin Laden videotape. Well congratulations on pulling out a quote. First, the above is a thought that bin Laden described having in 1982. It is not the same as your claim bin Laden said he ordered the hijackers to the United States near two decades later. When I was fifteen years old I decided that I wanted to be a fighter pilot… I worked toward that end but it wasn’t to be… though obviously you would still claim I am a fighter pilot today… I assure you I’m not, despite my earlier decision. Second, just for the record, the translation above is at odds with that ‘Al Qaeda’ provided. The original translation is, “we should destroy towers in America”. I think ‘Al Qaeda’ know better than anyone the English message they wanted to convey. Which in all leaves your claim unfounded - bin Laden never accepted responsibility for 9/11. He credited Atta for the operation. He's on about the 2004 bin Laden videotape. Al Jazeera, posted his comments, which was another hint, and the U.S. tried to discourage the tape from being shown, which was yet another hint. All these little hints seem to have been overlooked. 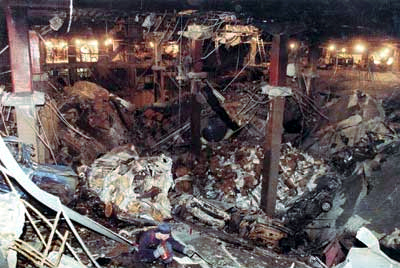 Since it is obvious that there was no way that steel support beams could have been properly prepared and explosives properly planted at the 77th floors and above before impact and not attract the attention of thousands of workers inside the buildings, no explosives could have been planted and not draw a lot of attention. Again well done for getting the claim correct - before impact. The demolition materials were very simple to plant under cover of ongoing fireproofing and steelwork refurbishment in the elevator shafts which provided access to the core columns. The company contracted for this had carried out previous structural demolition work and rented offices in both towers. The CEO of the company was Tom Leppert (former White House Fellow and later recipient of the Torch of Conscience award from the American Jewish Congress). It was all rather too easy to plant the demolition materials.